Why Visit Your Family Dentist in Marysville Regularly? Be proactive about your oral health. That’s the driving force Darby Creek Dental. Your family dentists in Marysville, Drs. Cleveland, Budendorf, and Tschand, provide a full range of preventive, restorative and cosmetic services for you and yours–no matter their ages. The foundation of their care is the regular, semi-annual visit. What’s Magical about Two Times a Year? your dentist in Marysville has seen it all–tooth decay, infection, gum disease, bite problems, tooth loss. The dentist knows some of the most damaging and expensive dental conditions could be avoided with daily flossing and twice-daily brushing and routine exams and cleanings at Darby Creek Dental. These people benefit from more frequent visits to stop tooth loss and advanced gum disease (and its long-term health effects such as diabetes and heart disease). Plus, as the American Dental Association states, your mouth says a lot about the rest of your body. Frequently, signs of infection or a serious bodily deficiency appear in your mouth before your physician detects it elsewhere. 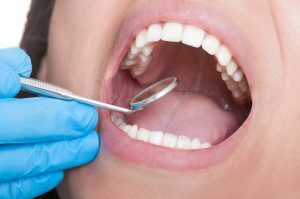 Additionally, the dentists at Darby Creek Dental perform a quick and painless oral cancer check with every regular examination. The Oral Cancer Foundation says that about 54,000 new cases of this deadly disease are diagnosed in the United States each year. With early detection and treatment, many are curable. So, beginning when a child’s first teeth erupt and continuing through senior years, semi-annual exams, digital X-rays, and cleanings are the rule. Also, the doctor updates the patient’s medical history and a list of prescriptions. If needed, X-rays look for hidden decay, abscesses or other problems not detected on a visual exam. Finally, a skilled hygienist cleans and polishes the teeth, removing sticky plaque and hard tartar. Even with good brushing and flossing at home, plaque and tartar build up quickly, and with it, come decay, bad breath and gum disease, a leading cause of tooth loss in American adults. The team at Darby Creek Dental welcomes your questions at exam time–or anytime you have a pressing oral health concern. They want their patients fully informed of their oral health and also to fully participate in their treatment plans. After all, it’s your oral health! When did you have your last dental exam? Please don’t procrastinate. Contact Darby Creek Dental today to arrange a convenient appointment time. We have early and late appointments to accommodate your busy schedule. Comments Off on Why Visit Your Family Dentist in Marysville Regularly?